Getting your stream to a good enough quality so that it has the production value that looks and feels professional is dependent on a number of factors. Things such as bitrate, hardware, software, and OBS settings are just a few that will impact your final results. In order to improve your stream quality, you can improve all of these although you must remember that spending $5,000+ on a setup does have diminishing returns. In this article, I will tell you what has worked best for me in order to achieve a 900p stream that runs at 60fps for any game that I run. While it’s great to have a fully spec’d out gaming rig you need to be aware of the limits that streaming platforms put in place which bottlenecks what streamers can output to their channels. I personally stick to 900p 60fps as I find that I maintain super smooth video output while maintaining a crisp, clear image. Recently Twitch increased their upload data limits to 6000kbs per second. I’ve tried running at this with a fully capable setup and it doesn’t run as great as you would think. I think until we can get to 10,000kbs we won’t be able to run reliable, smooth 1080p at 60fps. Although with the increase you can now run higher resolution gameplay more comfortably. You can look at Twitch’s recommended settings and work backwards from there with the setup you want to create but from my experience, it can be a bit confusing. 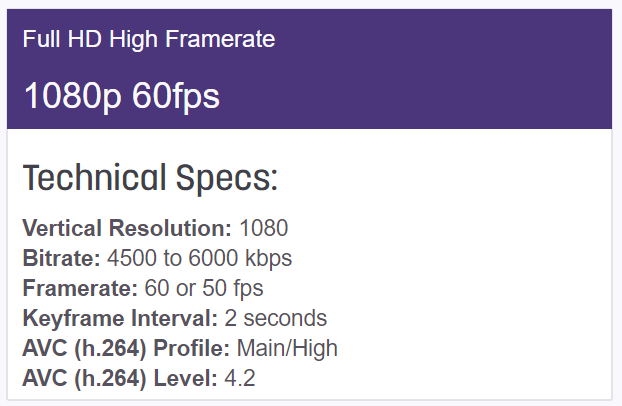 Currently, the highest output you can have to Twitch is 1080p 60 frames per second (fps). YouTube, on the other hand, allows streamers to output up to 4K @ 60fps. For this, your CPU is going to take a hit and your bandwidth is going to have to be solid. I haven’t tried out every combination of hardware that is out there but I can tell you what has worked from my experience. I’ll break down what can get you that crisp video output while still maintaining a good looking framerate so that your gameplay isn’t hindered while you stream. AMD’s new Ryzen line-up – as these have 18 cores and 16 threads, these CPUs are built for multitasking, something that encoding livestreams requires. You want more cores and threads to spread the workload because encoding is very CPU focused. The more cores and threads that you CPU uses the lower your clock speed will be. This is important for maintaining in-game fps while you are also encoding. Nvidia GTX 1080 – these are now a couple years old as Nvidia are due to come out with their new RTX range. I would also recommend if you can afford it to run dual GPUs. This will allow you to achieve better graphics when you’re in game. It is almost a must if you want to stream to YouTube in 4K as it’s often difficult for a single card to be able to handle. As streaming is multitasking heavy as you’ll be running Chrome, OBS/Streamlabs/XSplit, Twitch desktop app as well as a game at minimum, you’ll need at least 8GB but I recommend 16GB to ensure that you have a smooth experience. In terms of what time of RAM to go with, I’d say that if you have DDR3 or DDR4 you will be just fine. Although DDR4 is the newer RAM, you won’t notice too much of a difference so it’s a component you can save a few bucks and put into something else. If you’re reading these kinds of articles you probably already know that SSDs are the better choice over HDDs. In terms of which one, well that’s preference. I currently use a Samsung 860 Evo 500GB and have never had an issue with it. Some other really solid options are Samsung 860 Pro, Gigabyte UD Pro and Mushkin Reactor (has a good price tag). I’ve written about cameras before on this site and definitely recommend using a DSLR if possible. It is a great improvement you can make in your stream and helps your audience connect with you more. The Logitec C920 is a great option for webcams if you don’t want to get the full DSLR set up and comes with an affordable price tag. Feel free to see camera setups for OBS in my other post and learn how to run it within OBS. While visuals are one component of streaming, you still need to have top-notch audio so that people can understand you. If we go back to this screen, we are able to adjust all of our audio manually. Your Mic/Aux is where you control your microphone’s audio. As a rule of thumb, you want the bar that lights up to hit the center of the yellow. This will make it so that everyone can hear you clearly but it won’t be too loud. Speak into your mic and play around with this. Adjust your slider as you test it to find the sweet spot. I also highly recommend that you run a test stream and play it back to soo how it sounds. The Desktop Audio is the gameplay sounds that will come from your computer. For this, I would recommend that you have this lowered a bit so it hits the end of the green or the bottom of the yellow. The reason for this is so that the game sound doesn’t drown out your mic audio. For Webcam, you can leave this alone. The only time that you will need to change this is if you’re using the microphone that is built into the webcam. If you need to do this then simply test it out and find what works for you. 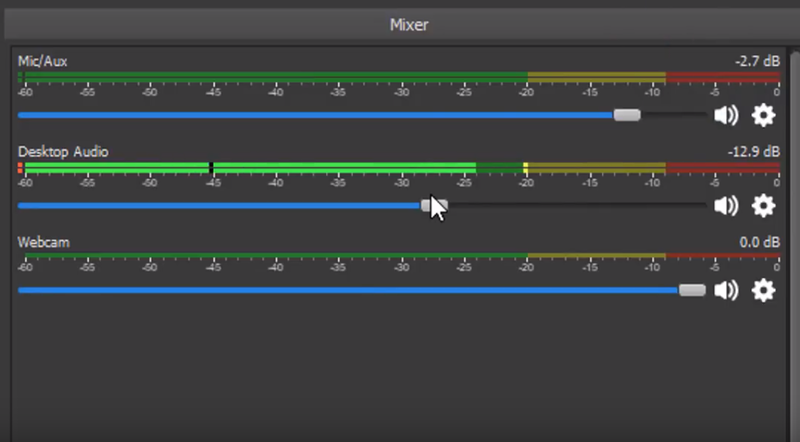 OBS also allows you to use filters which are extremely handy in improving your audio’s sound. To access these filters go to the gear icon under Mic/Aux and click Filters. There are a few filters that you can use but you don’t need to use a lot of them to significantly improve your sounds. I personally just use Noise Suppression, Noise Gate and Compressor. These three together give crispy, clear audio. To add these filters just click the bottom left + button of the filters window. Noise Suppression eliminates the background noise. You can play with this and you will need to adjust this depending on your recording space. Don’t suppress your audio too much because it will have an effect on your voice. 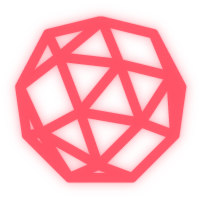 You only want to adjust it so it just cuts out all of the background sounds that are there eg. fans, air conditioner, dogs etc. I set mine to -30db. Noise Gate will set a threshold of how much sound needs to be created in order for your microphone to pick it up. This is useful when you have an intense moment or just don’t want every little noise to get picked up while you’re streaming. The Compressor can be the most finicky as it changes a lot from each microphone to audio surroundings. Just play around with these settings and listen back to your recordings. You will be able to hear the difference in how clear your voice is when you’re speaking. There are so many components that go into making the production value of a stream great. From hardware, software and just your surroundings. The two most important things when it comes to improving your streaming quality is your software settings within OBS and having decent (not state-of-the-art) gear. From my experience, a lot of this is trial and error and you can spend hours upon hours tweaking each little setting to get it right. I’d personally recommend that you stick to 900p 60fps if your PC can handle it. This will allow for you to have that perfect balance of quality and framerates which most PCs can handle.